An interdisciplinary team at The Ohio State University, led by Professor Raymond Cao, will spearhead a research thrust area within a new consortium focused on nuclear nonproliferation. The National Nuclear Security Administration, overseen by the United States Department of Energy, has established the consortium with the goal of strengthening the nation’s nuclear security. The Consortium for Enabling Technologies and Innovation, led by Georgia Institute of Technology, is a collection of 12 universities and 10 national laboratories that will develop and refine technologies supporting the nation's nonproliferation mission to detect and characterize the production of nuclear materials. The consortium will perform basic research in computer and engineering sciences for nonproliferation, advanced manufacturing for nonproliferation and novel instrumentation for nuclear fuel cycle monitoring. Ohio State’s Department of Mechanical and Aerospace Engineering and Department of Electrical and Computer Engineering will share $2.75 million of the consortium’s five-year, $25 million funding. Cao is the lead investigator for one of the consortium’s three thrust areas: Novel Instrumentation for Nuclear Fuel Cycle Monitoring. In that role he will guide the technical direction of research, facilitate cross-cutting research between different thrust areas, coordinate student-faculty visits to labs, and organize seminars, courses and workshops. 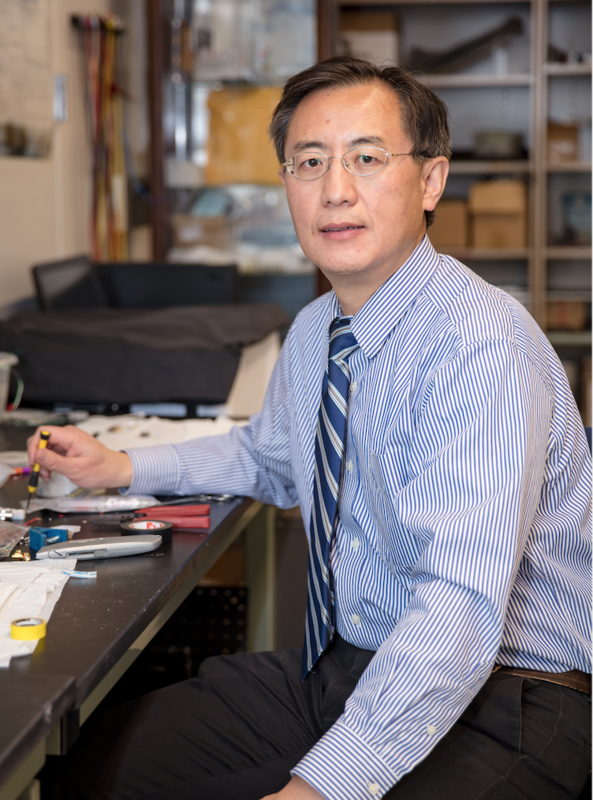 Cao in his lab at Ohio StateAdditionally, Cao is the principle investigator on one of the thrust area’s subtopics, Microelectronic Components and SWaP (size, weight and power). Co-investigators include colleagues from Ohio State’s Department of Electrical and Computer Engineering: Anant Agarwal, Siddharth Rajan and Steven Ringel. The consortium includes the University of Wisconsin as leader of a second thrust area. Other involved institutions are Colorado School of Mines, Duke University, Massachusetts Institute of Technology, Texas A&M University, University of Hawaii, University of Michigan, University of North Carolina at Chapel Hill, University of Texas at Austin and Washington State University. They are joined by national laboratory partners: Argonne National Laboratory, Brookhaven National Laboratory, Idaho National Laboratory, Lawrence Berkeley National Laboratory, Lawrence Livermore National Laboratory, Los Alamos National Laboratory, Oak Ridge National Laboratory, Pacific Northwest National Laboratory, Princeton Plasma Physics Laboratory and Sandia National Laboratory.